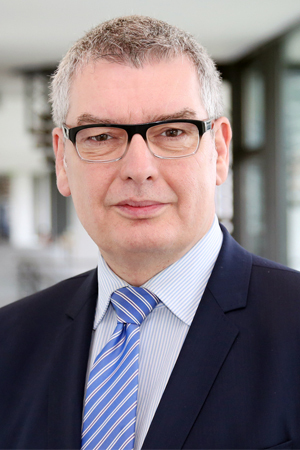 Patrick H. Leusch is Managing Director of the Global Media Forum, the global conference on media and foreign policy, organized annually by Deutsche Welle. He also is CEO of the DW Media Services GmbH, a company owned by Deutsche Welle. Before he was Head International Relations of DW Akademie, a world leading media development organization Patrick was responsible for the organization’s advocacy activities, international networking and fundraising and he represented the organization in a range of partnerships with international agencies, networks and towards political bodies, such as the European Commission or UN. For more than 10 years Patrick has been coach and consultant for political communication. His clients range from civil society organization to government representatives and communication specialist of national and international public organizations and institutions e.g. in Tunisia, Ukraine, Egypt, Sub-Saharan Africa, Belgium and Germany. Patrick was Secretary General and Member of the Steering Committee of the Global Forum for Media Development, GFMD, the global network of media development organizations since September 2016. He participates regularly as a speaker and moderator in international conferences and fora and he has published a range of articles in the field of media development and international cooperation. Patrick is Belgian and grew-up bilingual French-German. He holds a Master in Psycho-Pedagogy. He worked for many years as an independent TV and Radio reporter, editor and producer. He was a senior editor for leading German broadcasters and served as the correspondent for Western Africa or the German public radio, ARD, in Rabat Morocco. In 1999 he merged his interest in psychology, pedagogy, development cooperation and journalism and became a trainer and consultant for journalists and media executives in Africa, the Arab region and Asia. After joining DW Akademie, Patrick was in charge of all projects in the French speaking part of Africa for many years. In 2008 he became Head Project Development at DW Akademie and built a dynamic team that started successfully developing innovative comprehensive long term media development strategies and projects for international donors and partners.